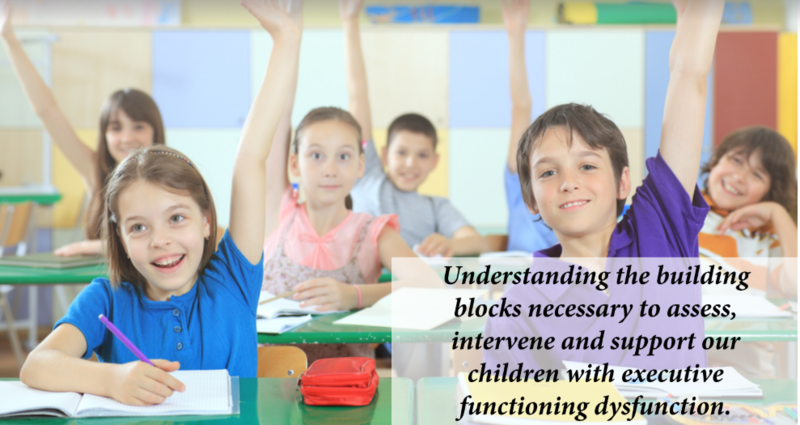 Understanding the building blocks necessary to assess, intervene and support our children with executive functioning dysfunction. Executive Functioning skills are becoming a big "buzz" word of today, though in reality always was encompassed in the world of occupational functioning. Executive Functioning goes beyond intelligence and speaks to the ability to organize, to write what you are thinking, to adhere to time-lines, to be disciplined in study methods. Sensory processing is the foundation on which skills are built in the early developmental years. Executive functioning is the skill set needed to see the child through her school career, preparing her to go to her choice of institution of higher education or vocational education. Therapists working in education systems will find this course very practical in approach, as well as understanding in more depth the contribution we are making in the child's occupation as a school student. Therapists in clinical practice will find this course helpful in analyzing and implementing the contribution that clinical practice brings to the daily occupational function of the child. This course will provide the therapist with the building blocks necessary as well as discuss tools to assess, intervene and support clients. Review and analysis of 10 major executive functioning skills. Exploration and analysis of 3 assessment tools to target executive functions. Exploration and analysis of 7 layers of sensory-motor development on executive functions. Treatment strategies applying therapeutic techniques to assist with intervention. List the 10 major executive functioning skills. Consider and utilize 3 assessment tools to target executive functions. List and demonstrate the impact of 7 layers of sensory-motor development on executive functions. Apply and demonstrate techniques to assist with intervention of executive functioning skills.